The oldest of the Royal Parks, Greenwich Park is home to the Greenwich Meridian, making it the theoretical beginning and end of the world and also the home of time. So in a roundabout way, runners owe a lot to Greenwich for providing us with a constant measure from which to gauge all our performances. And Greenwich Park has another unforgiving measure in store for runners: hills! Sitting just south of the Thames, behind the famous historic buildings of Greenwich, Greenwich Park is famous for the Royal Observatory and the meridian line (longitudinal 0-point) and is also a major hotspot for runners. The northern section of Greenwich Park is flat with a pond and several open fields. Moving south it quickly rises up to three hills side-by-side, each with great views of the city. The centre hill is home to the Royal Observatory and meridian line, but each of the peaks is worth a look and perfect for a post-run picnic on the grass. South of these hills, the park plateaus and is dotted with trees and crisscrossed by many sealed trails (and some grass trails as well). 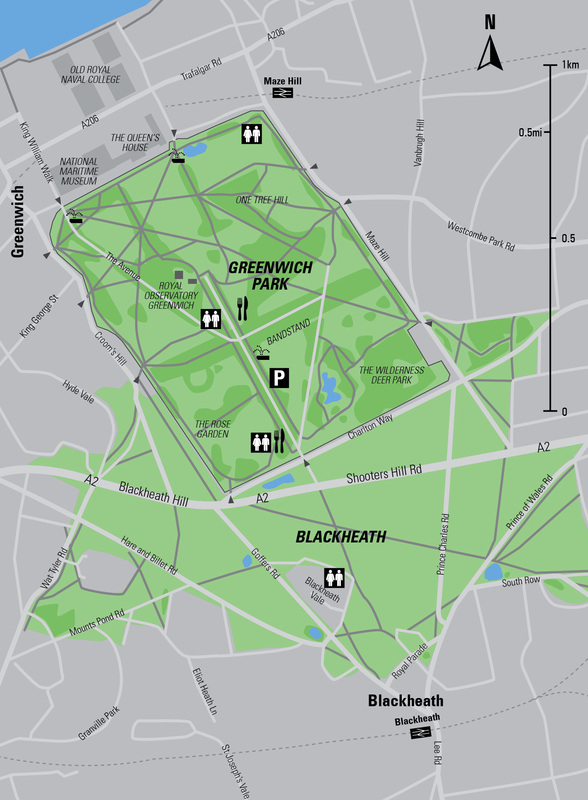 The park is largely flat all the way to the wide, open expanse of Blackheath. Just before you get to Blackheath, in the southeast corner of Greenwich Park, is the fenced Flower Garden and a woodland area (including deer sanctuary). Both provide some interesting twists and turns for a quick diversion away from the regular park. It’s easy to put together some nice loops through Greenwich Park, and a complete circuit around its circumference (including a diversion through the Flower Garden) is 2.0mi. The Blackheath grassland is a large open space not used for any particular sport. 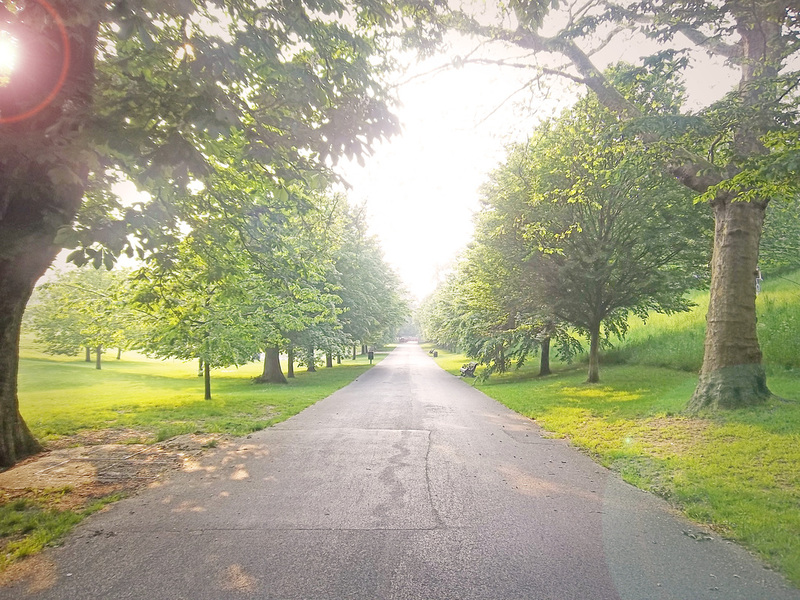 However, for the runner, it has grass trails crisscrossing its expanse, and it’s possible to follow its perimeter for a 3.8mi (6.1km), zigzagging loop. Weather Warnings: Blackheath can be quite exposed to the wind. Traffic Warnings: Take care on the busy Blackheath roads. Times: Opens year round at 6am and closes at various times between 6pm in winter and 9:30pm in mid summer. Blackheath is always open. Toilets: Children’s Boating Lake (the park’s northeast corner), The Avenue (the centre of the park just beneath the observatory), and Blackheath Gate. Rail: Cutty Sark DLR Station (0.3mi north) & Greenwich National Rail Station (Southeastern Line; 0.4mi west). Riverboat: Hop off at Greenwich Pier (follow the signs 0.5mi to Greenwich Park). THUMBS UP | An historic site with great gardens, views, and hills. Plus longer open hours than many London parks. THUMBS DOWN | The squirrels are friendly, but sometimes a little too much so—make sure you don’t accidentally step on one while flying down a hill!